Why would I need self storage in Naperville, IL? There are a variety of reasons why you might need self-storage in Naperville, IL. How much is a storage unit in Naperville, IL? The cheapest storage unit in Naperville, IL is $27.00 per month. What size storage units do you have available in Naperville, IL? In Naperville, IL we have sizes that range from 5'x5' to 10'x30' to suit your storage needs. How much is it for a 5'x5' storage unit in Naperville, IL? The cheapest 5'x5' storage unit in Naperville, IL is $27.00 per month. Naperville is a large city just outside of Chicago, with extensive boundaries stretching across Will and DuPage counties. Because it lies within the Illinois Technology and Research Corridor, the city is home to a number of businesses and organizations, including many thriving commercial developments such as Nokia, Edward Hospital and Health Services and Nicor Gas. This suburb of Chicago is one of Illinois' largest cities, and its steady growth rate isn't expected to slow down anytime soon. Naperville has a charming downtown center complete with quaint shops in 1960s-style buildings. The retro look and feel of the downtown area and the quiet community vibe are a stark contrast to the vibrant hustle of downtown Chicago, and many people move here to get away from congested inner-city life. There's a thriving economy in the surrounding area, with plenty of jobs to take advantage of. 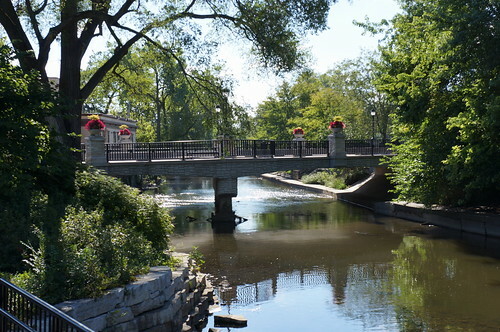 Plus, you can enjoy nearby attractions like the DuPage Children's Museum, Centennial Beach or the Naperville Riverwalk. You'll want to keep a few things in mind when you move to Naperville. Northern Illinois can get very cold in the winter. Icy winds blow in off the Great Lake, which causes lake-effect snowstorms. Bring cold-weather gear and consider upgrading to a vehicle with four-wheel drive. As a city within the Illinois Technology and Research Corridor, Naperville is home to a large number of companies, which has created a healthy and dynamic job market. These companies include BP, Nalco, Sikich and Nokia.The sharp growth of Naperville's economy contributed to a population boom in the 1980s and 1990s, continuing to fuel thriving commercial and industrial sectors today. If you're planning to look for a job in Naperville, you might want to consider one of its many large employers. Edward Hospital, Nicor Gas, Alcatel-Lucent, BP American and the local school districts provide thousands of jobs in a variety of roles between them. There are several prominent commercial districts in the city, like downtown Naperville, Freedom Commons and Springbrook Prairie Pavilion. There, you can find jobs in retail and food service. You can also find many car dealerships throughout the area, which provide roles in sales, vehicle maintenance and more. Community Unit School District 203 and Indian Prairie School District 204 serve the majority of Naperville's schools. There are also several private schools in the city, including both parochial and college prep campuses. Higher education is within easy reach in Naperville. Its main institution of higher education is North Central College, founded in 1870 and located in the downtown area. There are many more schools to choose from, however, with several major colleges maintaining satellite campuses in Naperville. Utilities: Naperville's Department of Public Utilities supplies the city with electricity, water and sewer services. Nicor Gas provides natural gas. Garbage and Recycling: Republic Services facilitates recycling collection, while Waste Management operates the trash collection program. Transportation: Naperville has a few Metra rail lines running throughout the city, as well as Pace Bus commuter services. While home prices are fairly expensive in Naperville, even by the Chicago-suburb standards, it remains a very popular relocation destination. There are plenty of homes to choose from in this large market, so you can find something to fit your budget and needs. Our lowest priced units in Naperville, IL average $41.83 per month. 256 people have reserved units in Naperville, IL in the past 30 days. There are 6 locations within Naperville, IL's city limits. There are 2 locations in Naperville, IL that offer AC and Heating features.